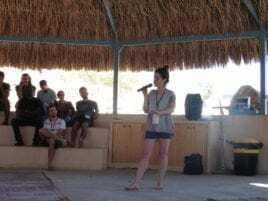 The 2018 Arava Alumni Peace and Environmental Network (AAPEN) Conference was held at the Institute in Kibbutz Ketura. It was attended by over 160 graduates, spouses and children, current students and staff from Israel, Palestine, Jordan and other countries. The conference began on Thursday afternoon with an informal gathering and optional tours of Kibbutz Ketura and the Off-Grid Technology Demonstration Village, to allow former students to get an update on recent developments at the Institute. After a festive barbecue dinner and opening ceremony, participants had an opportunity to network with each other before joining a nostalgic party at the Ketura pub. Friday morning was spent hiking the surrounding desert area in various groups, a well-loved activity among students at the Institute over the years. In the afternoon alumni shared recent activities and projects during an “open mic” session. In brief 2 minute updates, the alumni updated on business ventures, academic research, social activism, and creative ideas. Saturday morning was filled with various participant-led workshops ranging from professional to fun, such as a storytelling workshop, a brainstorming session for a five-year plan for greening the Arava Institute campus, fundraising tips for project advancement, and a discussion on Arava Institute alumni joining the upcoming Climate March together. The conference was brought to a close on Saturday afternoon with an emotional final session during which alumni sat in pairs to share what they will take onward from the conference. In small groups, alumni discussed how to continue to create a sustainable resilient community as an alumni network forward.